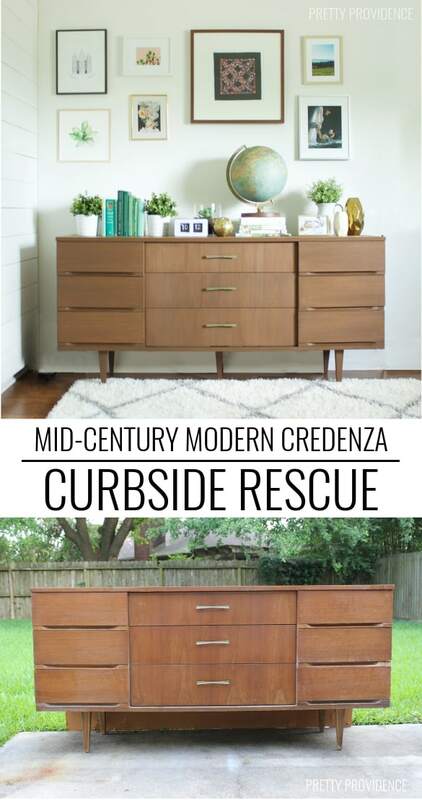 Curbside Mid-Century Modern Credenza – Rescued! See? Not that bad. 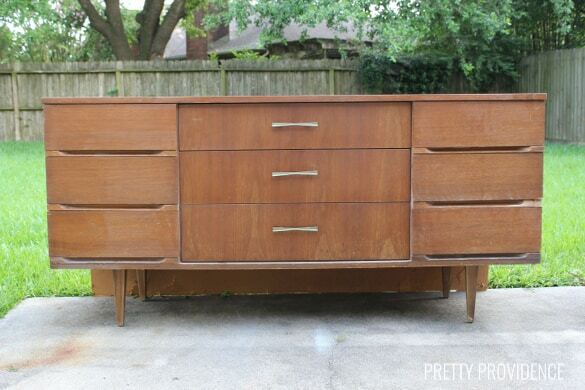 Yes, it needed some work but finding something like this on the curb? Really!? When I got home from my trip my husband and I looked it up and down and figured out what it needed. 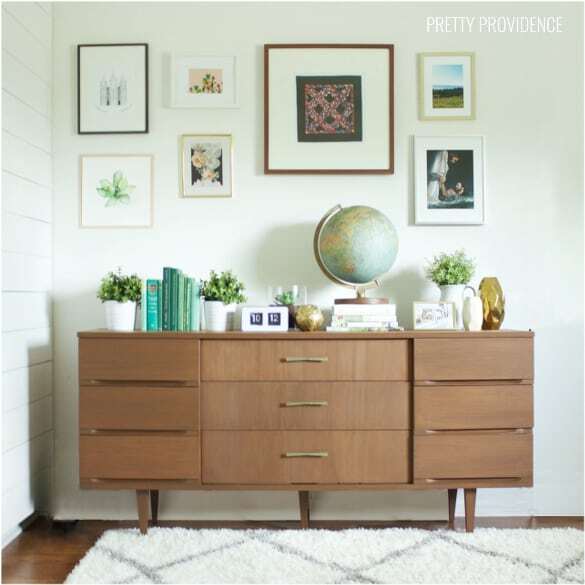 It’s solid wood with a nice thick veneer – which is awesome because we knew we could sand & stain it. 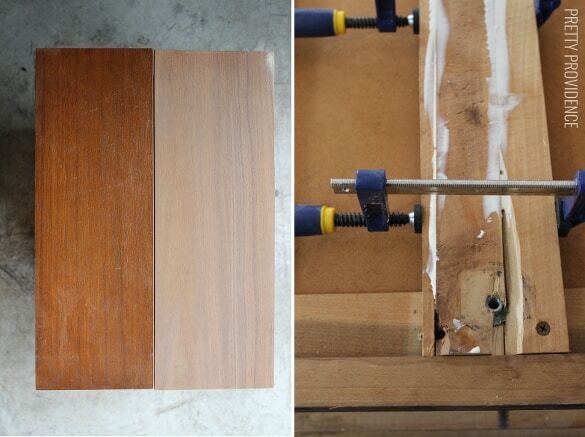 We used Elmer’s Wood Filler to fix the cracks and dents in the veneer. 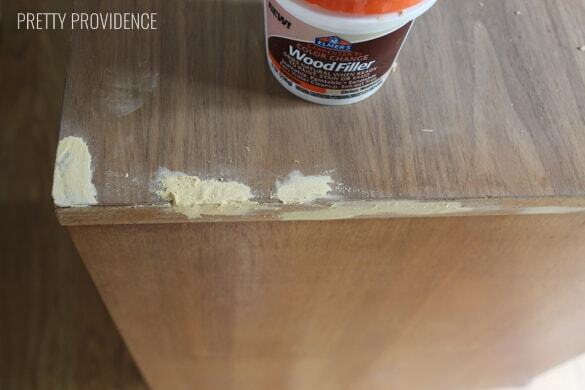 The cool thing about wood filler – you can sand & stain it and no one will ever know there was a flaw. It’s like magic. For the new back we got a big sheet of masonite backing cut to fit just right and screwed it in with a drill. Easy enough! 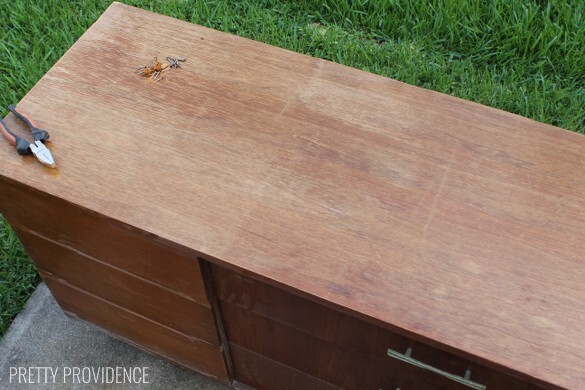 Above left: A drawer before sanding, and a drawer after. We used an orbital sander and 120 grit sandpaper for this. Heavy duty! Above right: Some cracked wood on the bottom. We added the wood filler and clamped it overnight. 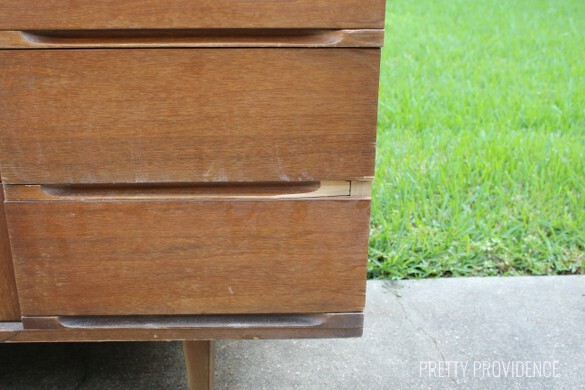 Then I got out my favorite DIY product – Minwax Stain Cloths! 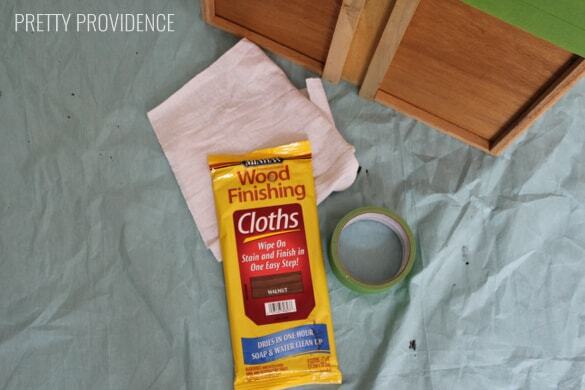 We used the Walnut color and went through about 12 cloths (1.5 packs.) You guys I’m so obsessed with these. They make staining so much faster + easier. You would think that this is sponsored but it’s not, I just love these. Should I reach out and ask to be their stain cloth spokesgirl? Since it was such a big piece with lots of drawers the sanding and staining did take a while but I think the end result is SO worth it. Isn’t she a looker? In real life she is a little bit darker brown. 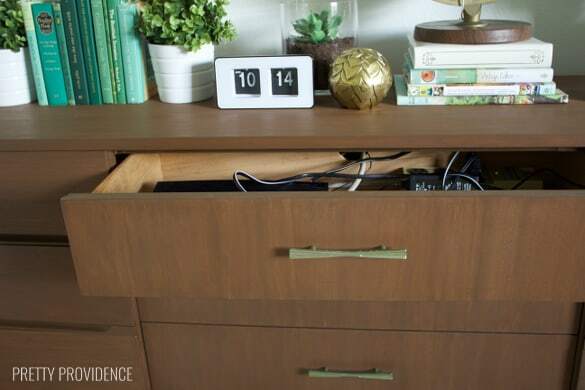 My husband also surprised me by cutting a hole through the top drawer and the back so we can use it as a media stand + the cords can be hidden. So there it is. Good as new! As I mentioned, my husband did a lot of the work so he deserves a shout-out. 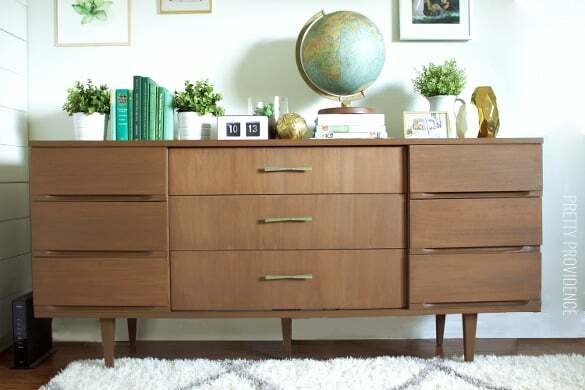 I am in love with my new/old credenza and I can finally cross of the “find junked furniture” item off, but I’m definitely going to be keeping my eye out for more amazing freebies! 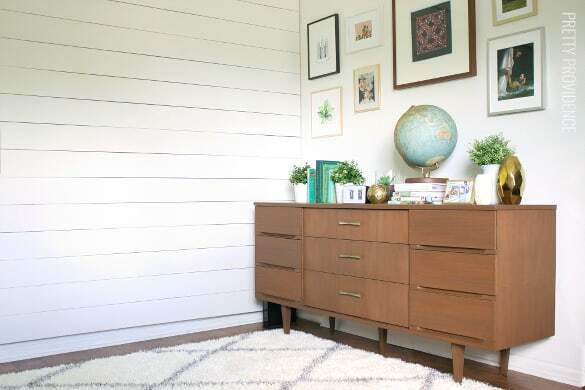 If you like this you’ll probably like our DIY Sliding Barn Door, Card Catalog Makeover and DIY IKEA Hack Desk Under $60! Oh my goodness! It’s so beautiful! This is amazing! What a crazy find!